by Joyce A. Baugh. Lawrence, KS: University Press of Kansas, 2011. 248 pp. Cloth. $34.95. ISBN: 9780700617661. Paper $17.95. ISBN: 9780700617678. Reviewed by William R. Wilkerson, Department of Political Science, College at Oneonta, SUNY. Email bill.wilkerson [at] oneonta.edu. 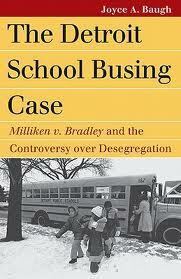 Milliken v. Bradley was decided two decades after Brown v. Board of Education. By 1974 significant desegregation had taken place in much of the South, and three years earlier, in Swann v. Charlotte-Mecklenburg Board of Education, the Supreme Court had given federal district courts extensive powers to carry out desegregation plans. The Swann Court approved virtually all aspects of running a school system, including extensive use of school busing to create racial balance within a school district. Milliken, however, presented an additional problem: how to desegregate a school system, Detroit's, that had become majority black and relatively impoverished. The eventual solution for District Court Judge Stephen Roth was to include the surrounding, overwhelmingly white, suburban districts that grew quickly after World War II in a regional desegregation plan. Roth's approach was affirmed by the Sixth Circuit Court of Appeals. On July 25, 1974 the Supreme Court struck down the multi-district remedy, finding no de jure segregation outside of Detroit. A Detroit-only desegregation plan was ordered. The Detroit School Busing Case tells this complex story with well written prose and notably clear organization. Joyce Baugh makes excellent use of archival sources such as court records, the papers of U.S. Supreme Court justices, contemporaneous newspaper accounts, and academic discussions. These are supplemented by interviews with lawyers representing both sides, journalists who covered the dispute for local newspapers, and the federal district court judge who ordered the case closed in 1989. Beyond the case itself, Baugh supplies a context for the dispute connecting the legal as well as socio-economic and political events that predated the litigation. As is standard with books that are part of the Kansas's Landmark Law Cases and American Society Series, there are no footnotes. There is a detailed bibliographic essay. The book also includes a detailed chronology of events at the end of the text. Chapter 2 is a detailed primer on the "Great Migration," the move of southern African Americans to the cities of the north in search of better jobs and an improved life. This chapter is critical to a broader understanding of the dispute. The black population in cities like Detroit, Chicago, Cleveland and Gary, Indiana grew rapidly in two waves during the twentieth century. The first wave took place in the 1910s and 1920s, with a second wave commencing after World War II. This second wave combined with the outmigration of middle and upper middle class whites to the suburbs that emerges after World War II changed the character of the Detroit metropolitan area. As the suburbs more than doubled in population from 1950 to 1970, they remained almost entirely white. The patterns of employment and housing discrimination facing the newly arrived are recounted as well. Job discrimination was widespread and separate job listings for blacks and whites were common into the 1950s. Housing was segregated by a series of private sector and government actions that included steering of Blacks to certain neighborhoods by realtors, restrictive covenants, lending policies supported by federal government agencies, highway placement, and the location of public housing. Similar tools were used to keep the suburbs white. Add to this the loss of much of Detroit's industrial base, and a poorer and racially changed city emerges. Chapters 3 through 5 address the labyrinthine dispute that emerged in Detroit, reviewing efforts by the Detroit Board of Education to desegregate its schools beginning in the mid-1960s and the litigation that followed. Pro-integration advocates were elected to the Board, and they hired a pro-integration superintendent of schools. The slow pace of change coupled with unrest in Detroit and beyond in the 1960s created a new complexity. In Detroit, some wanted the focus to be on school integration, while others advocated community controlled schools, making administrators accountable to school stakeholders. In 1969, Michigan enacted a school decentralization law and we see the roles of community activists, labor unions, business leaders, and government officials converge to create a limited desegregation plan that created a backlash in Detroit and in the state capital. The state rescinded the plan and reorganized the Detroit School Board to shorten terms of pro-desegregation members. Soon thereafter the pro-desegregation members of the Board were recalled by the voters. Within a month of the recision and recall the NAACP filed suit challenging the constitutionality of the state law. Over the two year period of the initial litigation the reader sees the transformation of the dispute and the district court judge handling the case, former state Attorney General Stephen Roth, a conservative Democrat. Roth initially removed the state of Michigan from the case and approved a magnet school desegregation plan. After being forced to hold a trial on the issue of segregation by the Sixth Circuit Court of Appeals, Roth found that de jure segregation took place in Detroit and further found that a Detroit-only remedy was not possible. He ruled that 54 school districts be included in the remedy. After multiple decisions, first by a panel and then the entire circuit sitting en banc, the Sixth Circuit upheld the finding of de [*529] jure segregation, but argued that the case must be reargued with the suburban districts getting a hearing before a metropolitan remedy could be imposed. At this point the U.S. Supreme Court stepped in and Chapter 6 takes Milliken through the U.S. Supreme Court's decision. The process of decision-making is clear. Baugh makes extensive use of the papers of Justice Harry Blackmun and others in recounting what went on behind the scenes to create the 5-4 decision rejecting a multi-district remedy despite finding evidence of de jure segregation. In addition, Milliken is placed in context with a discussion of other cases the Supreme Court heard during this period, such as Keyes, and the broadening school busing controversy in Boston that was on the front pages in 1974. The final chapter recounts the aftermath of Milliken locally and notes the important role it played in the changing landscape of desegregation cases after 1974. After noting reactions to the decision from a variety of perspectives, Baugh reminds us that litigation does not end once the U.S. Supreme Court rules. Rather, a U.S. District Court judge, with input from the District and the NAACP, developed a plan that was modest in scope, and more modest than even the school district proposed. The plan required the busing of about 10% of the district's quarter million students, moved district lines and required program improvements in all schools throughout the city. The judge also required the state to pay almost half of the costs associated with the plan. This plan was eventually upheld by both the Sixth Circuit Court of Appeals and the U.S. Supreme Court. Post-Milliken, the Court continued to decide desegregation cases, but thwarted by limits of de jure only segregation and school district lines, litigation had only a modest impact on school segregation in non-southern cities. The Detroit School Busing Case is a detailed and interesting single case study of a school desegregation case from outside of the South. One learns much about post World War II social and economic change in a northern city and the way that private action and government policy potentially shape a legal environment. The work is a cogent introduction to the topic of school desegregation efforts for students and lay readers, the primary audience for the book. The focus is on Detroit, but there is regular discussion of events throughout the United States allowing readers to make connections and identify larger currents. In addition it provides insight into complex multi-party litigation and the workings of the federal court system. The reader is able to understand the decision-making environment of the trial court judge grappling with the complex facts and myriad details in creating a remedy to a constitutional violation. Furthermore, the reader will have a better understanding of the dynamics of decision-making by the U.S. Supreme Court. For scholars, Baugh's account provides notable detail that will expand their knowledge of the Milliken case and the Burger Court desegregation cases. Far from the unified Court that appears to exist three years earlier in the 9-0 Swann decision, Baugh's research shows yet another example of the fractured relations and diverse viewpoints of the Court in the 1970s. All but the specialist in this area will glean something from reading this [*530] book. An important question remains, however: is Milliken v. Bradley a landmark decision? If so, how is it important? Steven Lichtman's 2010 review of the contents of constitutional law texts found that only one of 18 casebooks reviewed included the decision and a quick review of the casebooks on my bookshelf found that the case receives only the briefest of mentions if it is noted at all. If the book has a weakness, it is that it could do more to tell us why we should still be interested in Milliken almost 40 years later. Baugh does some of this in the final chapter. She notes, "While it is difficult to determine with precision the impact of Milliken, it is widely accepted that the decision has a major effect in hindering efforts to desegregate urban schools and to provide a quality education for students of color” (p.194). Milliken then, was the beginning of an end of an era of Court-supported desegregation efforts. In recounting this complex case, Baugh provides insight into the seeming intractability of the enduring American problem of racially segregated schools and the systematic poor performance of our nation's urban schools. Baugh notes in her introduction that when she began teaching at Central Michigan University in the late 1980s, a school with many students from the Detroit area, few students knew much about the desegregation battle that had been fought 15 years earlier. Much the same can be said for desegregation today and the nation as a whole. After brief flurries of interest created by the fiftieth anniversary of Brown in 2004 and Supreme Court decisions in Seattle, WA and Louisville, KY in 2007, the issue of school desegregation receded back to the shadows of American constitutional law. This book serves to remind the reader of the past of segregation and the continued separation in our nation's public schools by race and social class. Its detail provides insight into the social, economic, and political forces that led to school segregation and the difficulty of addressing it. In recounting Milliken, Baugh provides a lens through which to view larger public policy problems of race, public education, and the plight of our nation’s cities problems that remain very much with us today. Keyes v. School District Number 1 Denver 413 U.S. 189 (1973). Milliken v. Bradley 418 U.S. 717 (1974). Parents Involved In Community Schools v. Seattle School District No. 1, and Meredith, v. Jefferson County Board of Education 551 U.S. 701 (2007). Plessy v. Ferguson 163 U.S. 537 (1896). Swann v. Charlotte-Mecklenburg Board of Education 402 U.S. 1 (1971). Copyright by the Author, William R. Wilkerson.